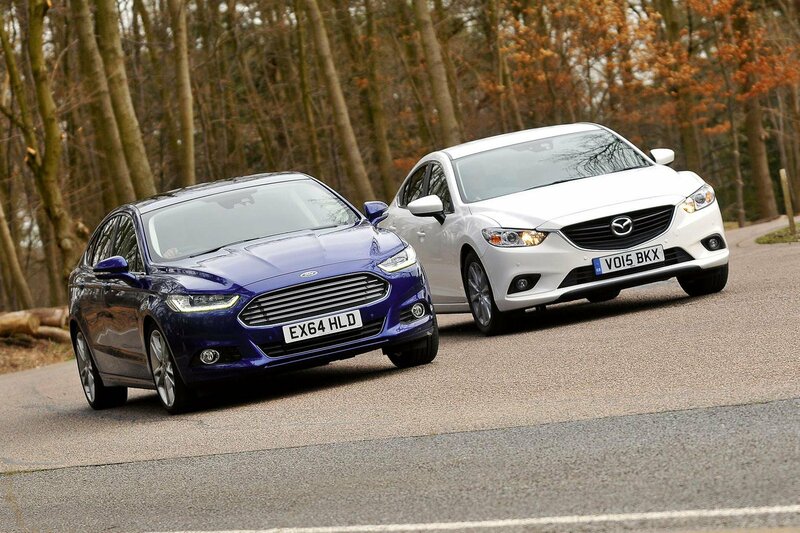 Ford Mondeo vs Mazda 6 | What Car? Say 'company car' and the Ford Mondeo will pop into most people’s heads – and for good reason: the latest version is a thoroughly impressive all-rounder. The fleet market is a tough gig, though, and customers are continually looking for the freshest, most cost-effective and most capable car. So, even though the Mondeo has been on sale for only a matter of months, it’s already facing competition from the revised Mazda 6. Launched back in 2012, Mazda’s sleek saloon has always had plenty going for it, not least a cracking 2.2-litre diesel engine. It’s so-so interior and disappointing high-speed ride stopped it troubling the class best, but those are the two areas Mazda has focused on with this facelift. If the improvements are big enough, the Mondeo could have a serious fight on its hands. These cars look pretty well matched on paper. Both have four-cylinder diesel engines that produce 148bhp, both have six-speed manual gearboxes and both are front-wheel drive. The performance figures are pretty similar, too. Head out in the Ford and its 2.0-litre diesel proves itself competent, if not remarkable. It’s fairly quiet and pulls well enough from low revs, although acceleration tails off above 4000rpm. The Mazda’s engine is even stronger low down, and pulls much harder than the Mondeo’s at higher revs. In fact, the 6’s motor feels quite like a petrol engine, revving willingly beyond 5000rpm. Put your foot down in the Mazda and it will surge ahead of its rival, even in the higher gears. For example, in fourth the Mazda gets from 50-70mph in a snappy 5.4sec. The Ford, meanwhile, takes a more lethargic 7.1sec. The Mazda’s extra torque and broader spread of power also means you don’t have to change gears as often. Unfortunately, the Mazda’s engine is its only trump card. Its steering is the biggest disappointment; it’s light and precise around town, but it doesn’t weight up enough when you’re cornering quickly. There isn’t a strong enough self-centring action, either, which means you always feel a little disconnected from the front wheels. The Ford, on the other hand, is distinctly more engaging. Its steering is heavier, more accurate and conveys more feedback when you turn in to corners. The Mondeo has more front-end grip, too, which means you can ultimately carry more speed along twisty roads. Fortunately, the Ford is also easy to drive around town and park. Mazda’s suspension tweaks have been pretty successful. The 6 is now more settled on the motorway and slightly more forgiving over bumps around town. However, the Mondeo is still the more comfortable car in all situations; in fact, few cars in any class ride as serenely. The rest of the Ford’s controls are heavier as well, lending the car an altogether more positive feel, but the catch is that the clutch can end up feeling excessively heavy in slow-moving traffic. The Mondeo’s gearshift is slick enough, but the Mazda’s is just as smooth and has a shorter, more gratifying throw. The Mondeo stops more quickly than the Mazda, and both cars feel equally stable under heavy braking. Similarly, road noise is about the same at motorway speeds in both cars, but there’s a bit less wind noise in the Ford. Step into the Mondeo and a modern-looking, if slightly dull, cabin greets you. There are neat digital displays set into analogue gauges, and the odd chrome strip and bit of gloss black trim to liven things up. The Mondeo’s interior still isn’t especially classy, though, with fewer soft-touch plastics than you’ll find in many rivals. Fortunately, that’s our only real gripe. There’s masses of space up front, visibility is decent, there’s a wide range of seat and steering wheel adjustment, and the main controls are easy to reach. It’s a similar tale in the 6, although the materials are a little smarter, giving the cabin a slightly more upmarket feel. It’s still a way behind a VW Passat for outright quality, but the 6’s instruments are clear and there’s a good range of seating and steering adjustment, so it’s easy to get comfortable. Head and legroom in the rear of the Mondeo are good, but taller passengers will feel a little hemmed in by the Ford’s low-slung roofline. You can sit three adults abreast in the back, at a push, but the central one will feel a little out of sorts and close to the roof. The Mazda is very similar in this respect, and occupants can feel claustrophobic in the rear-seat area, which can be quite dark. Storage spaces are equally prevalent in both cars, but the Mazda’s rear door bins are smaller than the Mondeo’s. The Ford’s media system quickly connects with phones but the actual touchscreen isn’t particularly easy to use. It’s slow to respond and the small icons are tricky to hit with any accuracy on the move. The menus can be confusing, too, although this would improve once you got used to the system. It’s certainly comprehensive – the Ford’s screen can show climate, radio, phone and sat-nav information simultaneously, whereas the Mazda’s will only cover one aspect at a time. Fortunately, both cars have separate physical heater controls, allowing for easy on-the-fly adjustments. The Mondeo has a huge boot, which is easy to access thanks to its hatchback opening. There’s even a spacesaver spare wheel, which is pleasing. The Mazda’s saloon boot is both smaller and nowhere near as easy to access, with a higher lip and smaller aperture. Still, there are levers in the boot to drop the 60/40 split rear seats. You only get a tyre repair kit though. The Mazda might be the faster car but it’s also cheaper to run than its rival thanks, in part, to a cleaner and more economical engine. Company car drivers will spend £608 less in Benefit in Kind (BIK) tax over three years to drive the 6, while private buyers will fork out just over £900 less over the same period to own the Mazda once all the costs – such as servicing, depreciation and VED – have been considered. Those looking at contract hire schemes won’t have to spend as much for a Mazda, though, with it costing £17 a month less. The Mazda’s significantly better fuel economy grants it another important edge. In our real-world True MPG tests it averaged 54.8mpg, which means 750 miles between fill-ups. The Mondeo, by contrast, averaged just 45.1mpg so has a range of 595 miles. Both cars are really well equipped, with satellite-navigation, climate control, automatic lights and wipers, cruise control and Bluetooth all fitted as standard. However, the Mondeo also gets a heated windscreen. The Mondeo also fares better on the safety front, with lane-keep assistance and speed limit sign recognition. Both cars achieved the full five stars in Euro NCAP crash tests, and security body Thatcham both gave them both five and four stars respectively for resisting theft and protecting against break-ins. The perfect combination here would be the Mondeo with the Mazda’s engine. Sadly, that’s not an option, which makes picking a winner fairly tricky. Both cars have their strong points, but the Ford has more of them. Its on-road manners and extra equipment will make it the more rewarding and satisfying car to live with, even though its running costs are higher, and its interior isn’t quite as smart as the Mazda’s. Verdict Great to drive and easy to live with. A fine car.